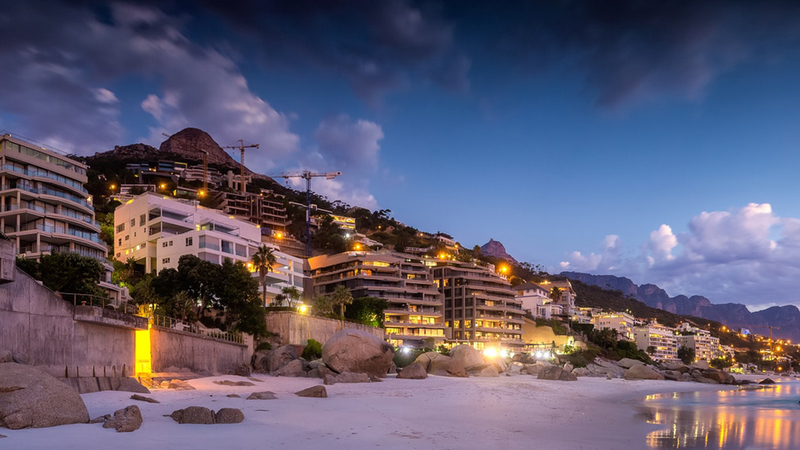 “After a slow first quarter, the 2018 property market is beginning to show promising improvements,” says Adrian Goslett, Regional Director and CEO of RE/MAX of Southern Africa. Over the period of April - June 2018, Lightstone Property recorded a total of 38,055 bond registrations at the Deeds Office, totalling an amount of R40,790,027,000. This is an 19.4% increase on the previous quarter that, in more concrete terms, equals a total of 6,180 more registered bonds. “The average bond amount granted during this period was R1,072,000 which is a 1.5% increase on the R1,056,000 of the first quarter for 2018. Additionally, only around 39,649 bonds were cancelled this quarter – 1,916 less than were cancelled in the Jan - March 2018 period. All of these figures point to a sturdy and strengthening market,” says Goslett. Of the 61,716 transfers recorded at the deeds office between April and June, a total of 8,836 (14.3%) were first-time registrations and 52,880 (85.7%) were repeat sales. This percentage split was much the same in the first quarter of 2018, as were the results for the top five most searched suburbs on the RE/MAX website. 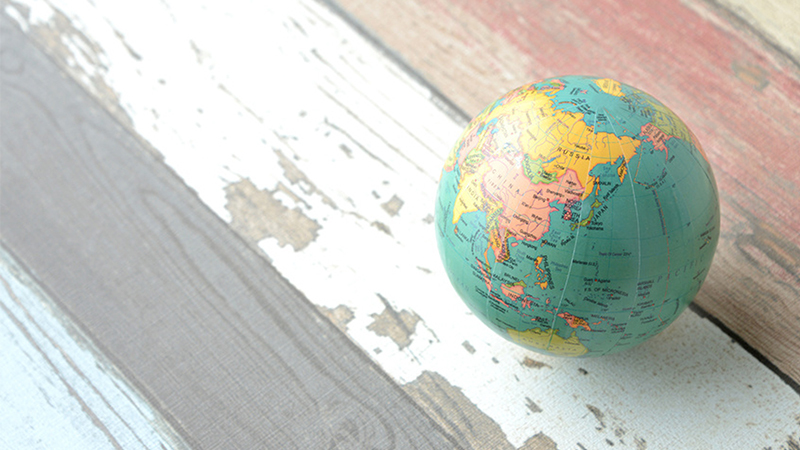 Gauteng and Western Cape remained the most searched regions, with Bryanston taking first place at 2,111 searches. 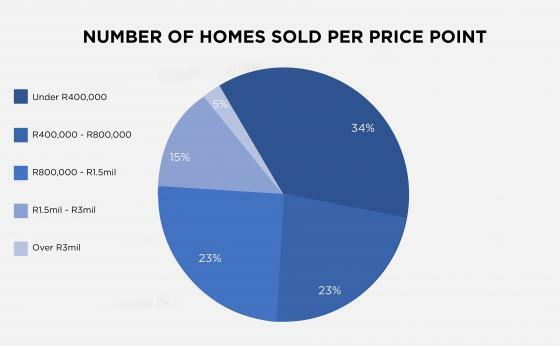 Unsurprisingly, homes priced at R400,000 and below still make up the largest percentage of properties sold each quarter. What is surprising, however, is that this quarter, only 34.2% of transfers fall within this price range, which is 3.9% lower than the figures from the first quarter. Similarly, down by 4.2%, only 23.3% were priced between R400,000 and R800,000. Beginning the upward curve at 1.1% higher than last quarter’s figures, 23.1% of transfers were priced between R800,000 and R1,5 million. Showing somewhat more impressive growth of 2.5%, 14.4% of transfers were between R1,5 million to R3 million; and, transactions over R3 million accounted for 5% of all bond registrations for the second quarter, climbing from the 3.75% at end March to higher than where it had been at the end of 2017 at 4.7%. 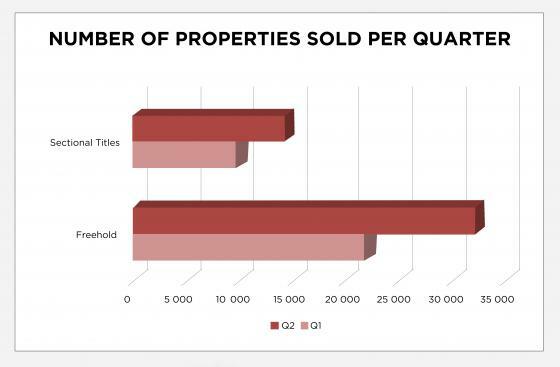 Significantly more sales have been recorded for this quarter than for the first quarter of the year. A total of 32,453 freehold properties and 14,431 sectional title units have been sold countrywide (*these figures exclude estates, farms, and land only transfers). This translates into a 49% increase in the number of freehold properties sold in the first quarter, and a 45% in the number of sectional title units sold. 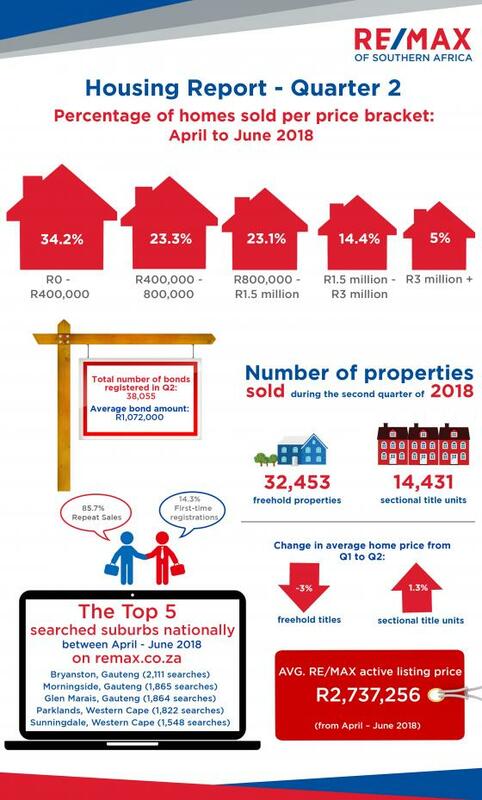 The average active RE/MAX listing price for the second quarter grew by 15% from last quarter to R2,737,257. Considering how each housing category is performing, Lightstone revealed that the current national median price of a freehold home now sits at R1,004,733 which translates into a 3% drop since the first quarter. “The drop in freehold property prices was likely the result of a slow first quarter which saw many homeowners adjust their prices in the second quarter to sell within a slow market. After a promising second quarter, however, we are likely to see prices grow in the third quarter,” Goslett explains. On the other hand, the national median price of a sectional title unit now sits at R1,010,752 which is a 1.3% growth price since the first quarter. Goslett attributes this growth to the popular trend of downscaled living. As the demand for these sorts of properties continues to grow, so too will their prices. “As predicted, the second quarter of 2018 has proven to show signs of a strengthening market. Provided fuel price hikes settle into more sustainable territory, and our political climate remains stable, we predict steady growth to continue into the third quarter of this year. Investors would do well to enter the market now before prices fully adjust to the upward spike,” Goslett concludes.